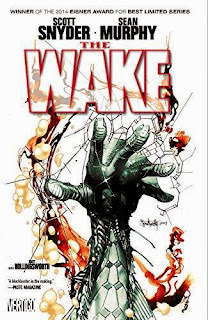 Scott Snyder's The Wake starts out as a cogent horror story -- an interesting, intelligent locale enough to make this feel like more than just another scare book, though with plenty of startling creatures jumping out of dark corners to deliver that good monster movie feel. But it is where Wake ends up that will likely define the story, in a steampunk aquatic sci-fi world of the kind Snyder might not necessarily be known for, until now, and with the kind of far-reaching, revelatory look at humanity that we might expect from Carl Sagan or Robert Heinlein. It can't be overstated the contribution artist Sean Murphy makes to this book. Snyder writes an enjoyable story, but what sets the book apart are Murphy's unrelenting depictions, especially of the book's weird settings. I haven't counted but I'd venture Murphy submits more multi-paneled spreads that span two pages in this book than just single multi-paneled pages, such that Wake really is a book that deserves the oft-overused "widescreen" moniker. In all, one has to root for Wake to make it to a screen, large or small. Murphy's work is, again, excellent, but the parallel structure of Snyder's story calls out for a Lost-esque flash-forward/flash-back presentation, possibly with the same cast doing double-duty. "Epic" is not too strong a word to describe this book. Part One of Wake put me in mind of Greg Rucka's Whiteout (overdue for a review here). Rucka's story is crime thriller and Snyder's is monster horror, but both are distinguished by taking the familiar trope and positing it in a unique and well-detailed location -- in Rucka's, the Antarctic, and in Snyder's, a secret research base at the bottom of the ocean. Each has an element of the claustrophobic to it; Snyder's Dr. Lee Archer travels somewhat readily to the ocean floor, and it's only when the sea creature Mers attack do we realize how all the escape routes have been shut behind Archer and the reader, one by one (the specter of Ridley Scott's Alien is certainly present throughout). Archer and company must try to escape even as, in horror movie fashion, they're picked off one by one. Smartly, Snyder uses Wake's unique structure to pull off a Hitchcock-ian trick halfway through, in that in contrast to our expectations even Archer doesn't make it out alive (or at least, not "alive" alive). But despite, in my opinion, the relative strength of Wake's first part over its second, certainly Wake finds its raison d'être in Part Two. Here, we flash forward to a veritable "Waterworld" (a movie with bad Kevin Costner connotations, but Snyder does it better) where young Leeward hunts Mers for fun and profit. Here, Snyder lets his imagination wild, with makeshift civilizations built up around flooded cities, a militant government devoted to the status quo, and renegade pirates plumbing the depths in a giant desiccated Mer corpse, whose similarity to the mythical Argonauts is more than just coincidental. Indeed, what Wake becomes as the audience swims deeper is a treatise, really, on all things water. Snyder's got Greek mythology here, for sure, and mermaids and sirens, but then also the Judeo-Christian flood story and the flood of Gilgamesh, to themes of environmentalism and conservation and even why people cry saltwater tears. In another twist not unlike protagonist Archer actually dying, Snyder further posits in the Wake world that humanity is ultimately the species alien to Earth -- to many planets, as a matter of fact -- and as such the Mers aren't even the villains of the piece that we might think they are. For me, Wake only didn't rise to its generally consistent level in its very last pages. Leeward meets Archer in the Mers' undersea "heaven," makes a certain peace with the Mers, brings down the military Arm's ship, and then rides off into the sunset with her dolphin. Snyder certainly suggests to us that everything will be all right -- the military is defeated, Archer and her crew of post-humans take off for parts unknown -- but I felt I lacked a sense of what Leeward had accomplished in a larger context and how the world would specifically change (defeat of other Arms, worldwide peace with the Mers, etc.). While Snyder's closing lines -- "Don't cry! Be brave! It's all an adventure!" -- perhaps match the swashbuckling aesthetic, I found them a tad flip, as if to say that the story, being a story, need not necessarily "work" so long as it's entertaining. Even as I acknowledge the constant role even "Row, Row, Row Your Boat" plays in the story and the recurring idea that "life is but a dream," I might've preferred an ending a little less dreamy, a little more solid. In total, however, Scott Snyder and Sean Murphy's The Wake is a visual feast, no question, and a sci-fi romp to boot. It surely seems to me that if Snyder ever tires of Batman, DC Comics ought give him Aquaman and it's clear he'd have something to say. Look for this one on the Collected Editions holiday gift list, coming up soon; a beautiful self-contained graphic novel (in essence if not in fact), this one will likely appeal to comics- and non-comics-reading horror and sci-fi fans alike. Next week, Worlds' Finest and Batman/Superman. Don't miss it! Friend, this HC is a standard sized edition, right? 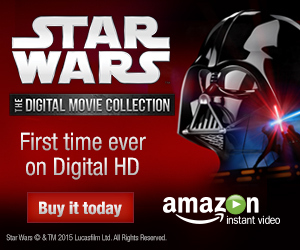 How many pages of extra content? Standard size near as I can tell, and about a dozen pages of extra content not including the variant covers. I thought DC will release this series in an OHC. Murphy's art always deserves it.